Hi Amazing Friends of the Colorado River! 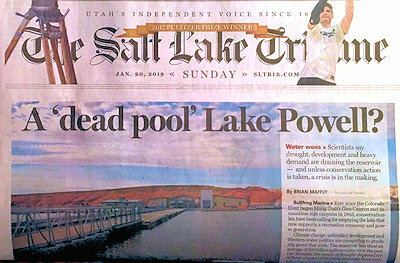 Last Sunday, the Salt Lake Tribune broke the logjam, revealing the science and facts about the predicted impact of climate change on Lake Powell and the Colorado River that no one wants to talk about. You don’t want miss this story! The story can be read by clicking here. Over the last three years, the Upper Basin states — Colorado, Wyoming, Utah, and New Mexico — have proposed and supported a “Drought Contingency Plan” to address the threat of the demise of Lake Powell. You may have heard about this Plan in news reports. The backbone of this Plan is to buy water from farmers to try and save and prop up Lake Powell. However, in order to save Lake Powell, hundreds of thousands — and perhaps a few million — acres of farms in these states may have to sell their water to the federal government and stop farming. We wrote a post about this proposal titled, “Why The ‘Drought Contingency Plan’ Won’t Work” — click here to read it. Save The Colorado supports science-based planning that takes climate change seriously and also protects flows in the Colorado River. We believe Lake Powell is doomed, and that we need to start planning for the draining of this reservoir — as well as the decommissioning of Glen Canyon Dam — as soon as possible. An orderly, professional, responsible plan with stakeholders at the table will yield the best result. 2019 is going to be an exciting year — stay tuned for all of the action! It’s your support that keeps us working hard to force everyone to take climate change seriously and protect the Colorado River.